Cancer ribbons are worldwide symbol for awareness of the different deadly cancers that affect many men and women, including children, these days. The various ribbons remind people that there is hope and ways to prevent cancers. While most people who buy, make and wear ribbons are those who have survived or know someone with cancer, everyone must show their support, concern and raise awareness by using these ribbons. Ribbon products that are exclusively designed differ. There are ribbons pins, ribbon appliqués, ribbon keychains, ribbon of hope pins, ribbon of survivors, and car ribbon magnets. To have an idea of which color is related to cancer, here are the different cancer ribbon colors and their meanings. One of the most common ribbons known to many people is the pink one. This is associated with awareness against breast cancer. It mainly symbolizes hope, and somehow reminds people the respect every woman needs. Another symbol for hope is the yellow ribbon. This is for bladder cancer awareness and sarcoma awareness. Compared to breast cancer, brain cancer is rare. But when you see someone wearing grey ribbon, he or she is currently fighting it, a survivor, or known somebody who has/had it. Both men and women, regardless of race and age, can have leukemia, a cancer of the blood. The ribbon for this cancer is orange. To raise cervical cancer awareness, the ribbon with teal and white colors is what you must wear. Cervical cancer is an illness that usually occurs to women only. Ovarian cancer is also a deadly condition of the health that affects that ovary of women. This only happens to women as well. For awareness, the ribbon is in teal color. A combination of teal, pink and blue ribbon refers to thyroid cancer. Do not be confused with teal ribbon, blue ribbon or pink ribbon. In men, prostate cancer is what they fear the most. You know someone has or had it, or supports awareness if he or she is wearing light blue ribbon. Another shade of blue is dark blue ribbon. This is for colon cancer, which affects both men and women. The alternative color for this cancer is brown ribbon. Childhood cancer is a type of sickness that primarily happens to kids. The ribbon color to raise awareness is gold. Whenever you see black ribbon, it is not always about death. It also refers to one of the skin cancers, which are melanoma, basal cell carcinoma, and squamous cell carcinoma. Ribbon in lime green color symbolizes lymphoma. This is also a rare type of cancer that affects either male or female, adults or kids. Liver cancer is among the cancers that have been increased in number of victims. It is important to wear emerald green ribbon to raise awareness. Those who frequently smoke are among the potential patients of lung cancer. To raise support and awareness, pearl and clear ribbon is what to wear. For pancreatic cancer and leiomyosarcoma cancer, purple ribbon is for their awareness. If you see one wearing this color of ribbon, it is either of those cancers. Sometimes, it also symbolizes testicular cancer and thyroid cancer. Burgundy ribbon is not usually seen placed in collars or in cars. But if you spot one, it signifies multiple myeloma cancer. For head and neck cancer (not separate illness), a ribbon pin in burgundy and ivory is worn to raise awareness. The alternative ribbon of uterine cancer is teal ribbon. However, it is more common to use peach ribbon, so it won’t create confusion with ovarian cancer. Kidney cancer is also a common type of cancer that affects people of any age, gender and race. For support and awareness, kelly green ribbon is recommended. Also, green ribbon is its alternative color. The periwinkle blue ribbon is not light blue ribbon. This symbolizes either stomach cancer or esophageal cancer. Testicular is related to a male’s private organ. So, testicular cancer only affects men. However, it is still essential to raise awareness by wearing orchid ribbon. A very unique ribbon is zebra stripe ribbon. This refers to carcinoid cancer. This ribbon is for colorectal cancer. The alternative color for this cancer is blue. For general cancer awareness, lavender ribbon is usually worn. This is picked if the cancer does not have any designated color. These are cancer awareness colors that are recognized by different local and international organizations. Each and every color basically signifies the kind of cancer. Regardless, it must serve as a reminder of hope and love to all victims, and support for their families. 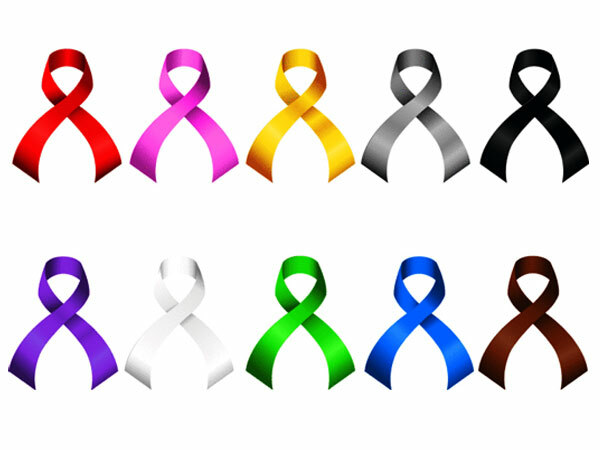 Supporters of these various cancers are mostly using and wearing these ribbons. If you are a survivor or a victim, wearing one is expected. If you are neither of those, it is still important to spread the word and love when you wear something like this. Perhaps now, you are very much interested to get some cancer ribbon products and have them displayed in your car, bag, bracelet, etc. It might be a simple thing to do, but it is a very much appreciated act that shows your concern to victims and survivors.